This pool is a spin-off of the popular Super Bowl Squares pool. The difference is you will be using the winning team's score and the losing team's score for all 3 games of the College Football Playoffs. If you would like to know the dates, times, and locations of the games please please refer to our When do the College Football Playoffs Start article. This pool is flexible as to the number of winning squares you can have. One option is to have 3 winning squares(the final score for each of the 3 games). Another option is to have 6 winning squares(the halftime score and the final score from each game). The last option is to have 12 winning squares, one for each quarter of each game. * If you choose to use quarter or halftime scores, the team that is winning the game at the close of the quarter or half would use the top row numbers. We say this just in case the winning team at the end of the game is different than the team that is winning at the quarter or half. Print the square grid from above and take the grid around to family, friends, and co-workers, having each participant place their name in the square or squares of their choice. 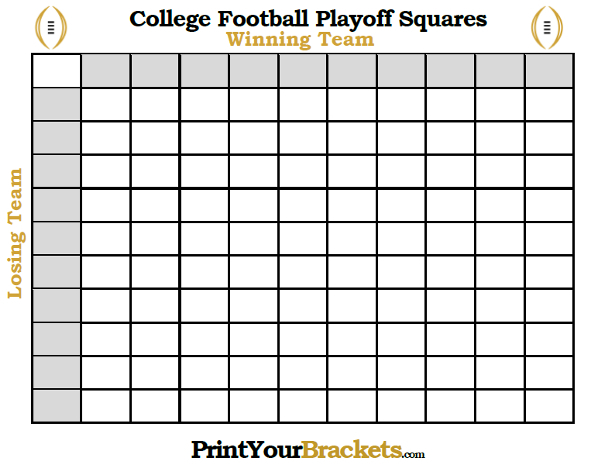 Another option is to use our Poster Size Football Squares or our Scratch-off Football Squares. To determine a winning square you will be using the last digit of each teams score at the end of each quarter/half/game. Example: At the end of the first game the winning team has 17 and the losing team has 14. Go to the top row of numbers(winning) and find the number 7(last digit of 17) then go to the left column of numbers(losing) and find the number 4(last digit of 14) find where these two numbers intersect on the grid and the name in that square wins the first game.